No matter where you’re coming from, the beach life isn’t too far away. When one visits the coast, water activities are definitely on the agenda. With miles of coastline, Virginia Beach drenches visitors in aquatic fun. Sign up for parasailing and get a bird’s eye view of life on the beach as you dangle hundreds of feet in the air. It’s the perfect place to search for sea life and take in the city. Seeking another heart-pumping activity? Why not hop on a surfboard? Virginia Beach is the birthplace of East Coast surfing, and it offers beginners and seasoned wave riders ideal conditions to learn the sport or improve their skills. Water activities in Virginia Beach are not limited to the ocean. This coastal city is a great salt marsh habitat, and there are miles of waterways to explore. The best way to do that? Hop on a standup paddleboard and propel yourself along the lakes and rivers and take in the natural beauty of Virginia Beach that can only be seen from the water. 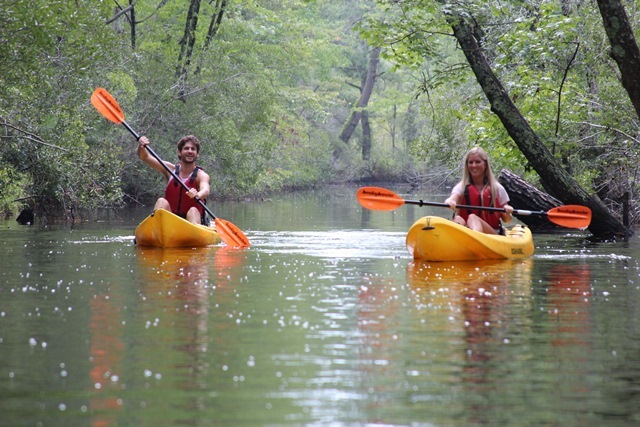 If paddleboarding isn’t your thing, you can opt for a kayaking experience instead. Row along the lakes and rivers, or journey into the Atlantic Ocean and search for dolphins. The Chesapeake Bay is brimming with fish of all sorts, which means there’s plenty of fishing fun to be had. If you have a boat, you can spend the day on the water with your crew, casting your lines out in hopes of catching a rockfish. For those who need some fishing assistance and guidance, there are several options for full or half-day private charter tours. 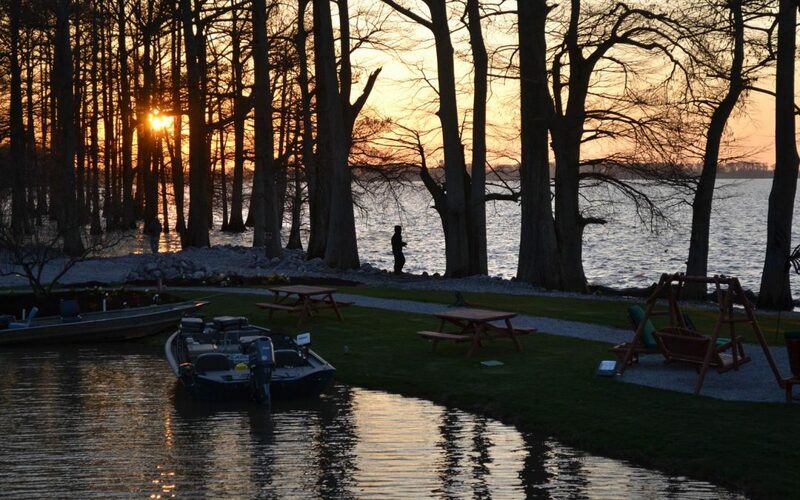 Or you can easily set up shop on one of the fishing piers, kick back with a cold beverage and soak in the sun. One of the best ways to experience Virginia Beach’s coastline is from the water and taking a boat tour is a fun and carefree way to take in the beauty of this place. Rudee Tours offers dolphin- and whale-watching tours that are fun for the whole group. Experienced guides narrate the trip, offering their knowledge of the area and these incredible creatures. Groups can also opt to explore on their own and rent vessels from places like Bay Venture Boat Rentals. In Virginia Beach, the fun doesn’t end when you jump out of the water. There are dozens of other activities to keep groups entertained, from museums and historical sites to outdoor recreation and exciting nightlife. Discover the history and heritage of the beachfront at the Virginia Beach Surf and Rescue Museum. The museum honors and preserves the story of Virginia’s coastal communities and their maritime past. Stroll through the exhibits that cover everything from the local surfing legends and lifeguards to famous shipwrecks and super storms that shaped the beach. Do you love duck decoys? Learn all about the evolution of the art of decoy carving at the Atlantic Wildfowl Heritage Museum. Located in the de Witt Cottage, which was built back in 1895, the museum houses memorabilia of the old hunt clubs, a wide range of original oil and watercolor paintings, and award-winning contemporary carvings by acclaimed artists. 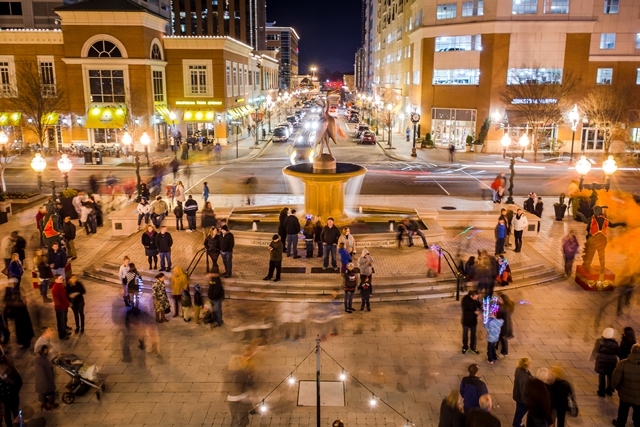 For some more modern art, check out the Virginia Museum of Contemporary Art. The museum features rotating exhibits of paintings, sculptures, photography, glass and video. You can even take an art studio class, if you so choose. History buffs should not miss the Military Aviation Museum. It houses one of the biggest collections of military aircraft from World Wars I and II through the Korean War. View some of the legendary planes that flew during the great war years, and even see a few of them in action as pilots take them out for a spin. 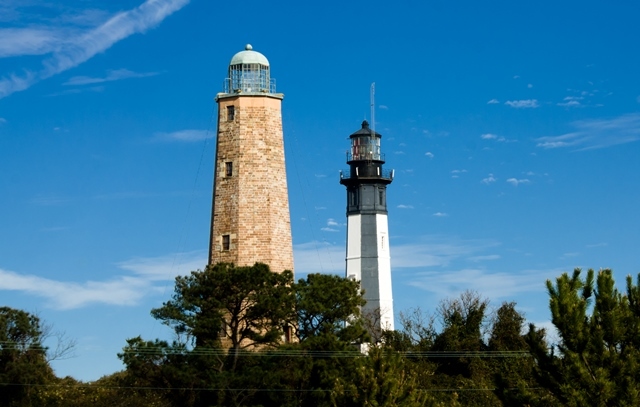 And speaking of military, groups can complement their MAM visit with a stop at Fort Story military base to view the historic Cape Henry Lighthouse. It’s the fourth oldest lighthouse in the country and the first lighthouse authorized by the U.S. government. Take a climb up the iron stairway and get an unimpeded view of the coast from the 360-degree lantern room. 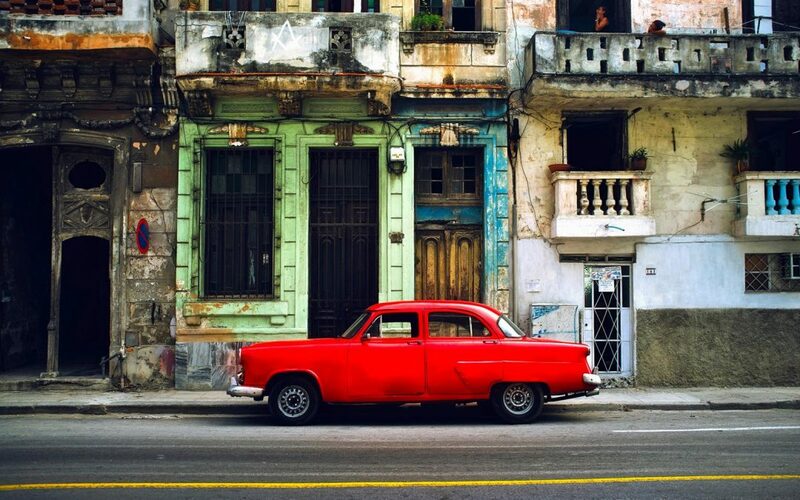 You don’t have to visit a museum to learn about the area’s past. Make a stop at the Adam Thoroughgood House, home of one of Virginia’s first colonists; the Francis Land House, which was home to a wealthy plantation owner and now serves as a historic house museum; and the Lynnhaven House, a wonderful example of early Virginia vernacular architecture. 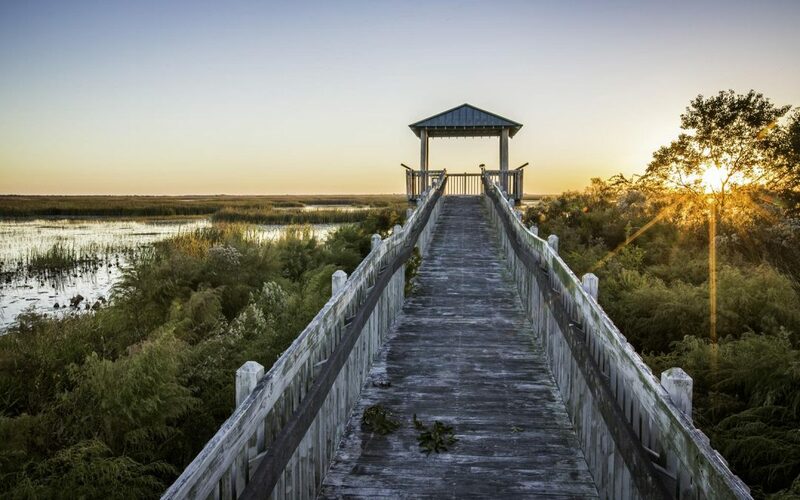 Enjoy the outdoors while simultaneously getting a quick history lesson at First Landing State Park. As the name suggests, this is where the English settlers landed back in 1607 and set up the first elective government in English America. The 2,888-acre park includes 1.25 miles of beach and over 19 miles of hiking trails that wind through the salt marsh habitat. With its proximity to Chesapeake Bay and miles of farmland, Virginia Beach is known for its delicious fresh seafood and locally grown ingredients. As a result, the culinary scene is booming with seafood joints, farm-to-table eateries and new craft breweries. With all the options to explore, groups will have no problem getting a true taste of Virginia Beach. Dive into a saucy plate of fall-off-the-bone ribs and meaty pulled pork at one of Virginia Beach’s famous barbecue restaurants. And with its range of options, and there’s something for everyone, no matter their taste. Bite into the famous burnt-ends sandwich at Whitner’s Pit – Smoked Barbecue, which was featured on the Food Network show “Diners, Drive-Ins and Dives.” Or dine on heaping dishes of chopped chicken or beef brisket at local favorites Smoke from Above or Frankie’s Place of Ribs. After you’ve sampled the barbecue, it’s time to try out the other famed food in Virginia Beach: oysters. In case you didn’t know, Virginia Beach is home to one of the best-known varieties, the Lynnhaven Oyster. 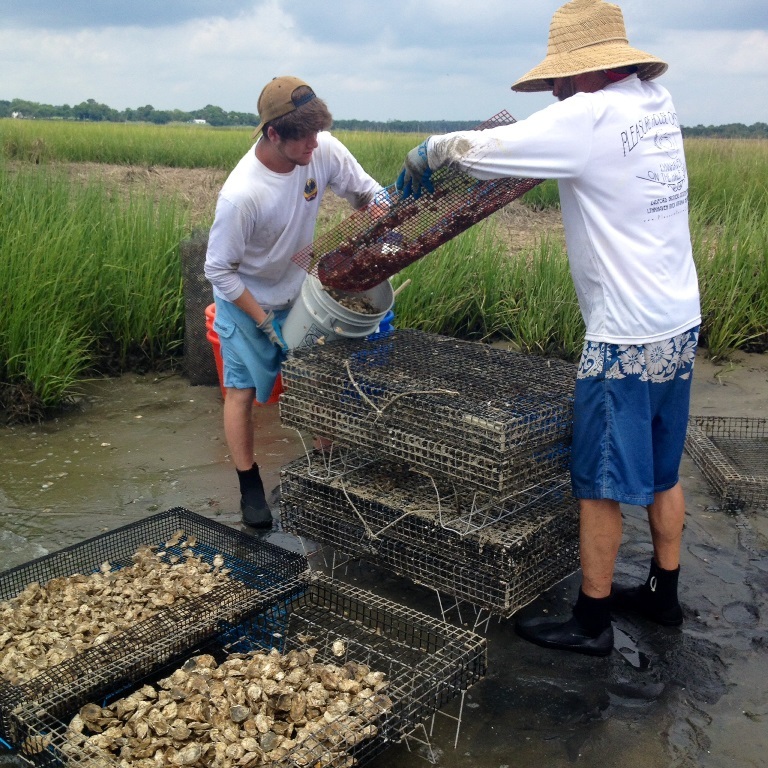 If you want the full experience, take a Pleasure House Oyster Farm Tour. Groups can hop aboard the farm boat and cruise the Lynnhaven River, learn about the legend of the oyster and slurp on the succulent bivalves. You don’t have to take the tour to enjoy these scrumptious sea creatures. There are several places around town that serve up Lynnhaven oysters, including Terrapin, Commune and Zoe’s Steak & Seafood. If oysters and barbecue aren’t your taste, don’t worry. There are plenty of other options you can enjoy. Start the day with a hearty breakfast at local favorite Doc Taylor’s, serving up classic dishes like biscuits and gravy, breakfast sandwiches and banana pancakes. Head to Aldo’s Ristorante for steaks, pastas and pizza; or enjoy a variety of favorites like burritos, burgers, club sandwiches and chicken fingers at Abbey Road Pub & Restaurant. Finish it all off with a sweet treat at The Royal Chocolate, where the crew can dip fruit, pretzels and pound cake in a melty pot of chocolate. Where Can We Stay in Virginia Beach? At the end of a long day of adventuring and exploring, you’ll need a cozy place to rest your head and prepare for the next activity. Virginia Beach has a range of accommodations that will fit every groups’ comfort level and price range. And no matter where you want to stay, there are several areas to select as a home base – from the lively oceanfront to peaceful Chesapeake Bay. Groups can stay at popular chain hotels like Best Western, Courtyard by Marriott, Hilton Garden Inn, or Four Points by Sheraton, among others. They can opt for a locally owned establishment, such as the Founders Inn and Spa or the Oceanfront Inn. Or kick back in a beachfront suite at Ocean Beach Club or Oceanaire by Diamond Resorts. Now that you’ve heard all about what you can see and do in Virginia Beach, it’s time to plan out your group trip. But before you jet off to your coastal adventure, there are some important steps to take to make sure you get the full Virginia Beach experience. In order to pack efficiently, be sure to look at the weather before you arrive. The temperature averages in the mid-80s in the summer to the mid-50s in the winter. It is humid, so prepare for those warm months to feel even hotter. If you’re driving to Virginia Beach or renting vehicles when you arrive, there are several places to park near the waterfront. Garages are open daily from 8 a.m. to 12:30 a.m., while other city parking lots vary with their availability and hours. There are parking pay stations pretty much everywhere you go, so be sure to pay attention to the meters and kiosks. While at the beach, remember to swim near a lifeguard. The Virginia Lifesaving Service operates 50 stations between 1st Street and 89th Street and Croatan Beach. For groups traveling with young children, it’s a good idea to look into the Find-A-Kid Program. Many of the hotels and motels participate in the wristband program. It’s free and voluntary, and helps parents quickly locate children that wander away by providing an identification wristband at the front desk. Stress should not be part of your vacation plans. If you need a little help organizing all the little details of your trip, contact the Virginia Beach Convention & Visitors Bureau. They can offer personal assistance and a wide range of resources, so you can fully enjoy your group vacation. Virginia Beach is conveniently located near Chesapeake Bay, in the Mid-Atlantic Coast. It’s a day’s drive from more than half the country’s population. Virginia Beach is three-and-a-half hours south of Washington, D.C., and minutes from major train stations, seaports and road routes. Norfolk International Airport is 20 minutes from the oceanfront and is serviced by most major airlines. Newport News/Williamsburg International Airport also serves the area if that option is more convenient for your group. 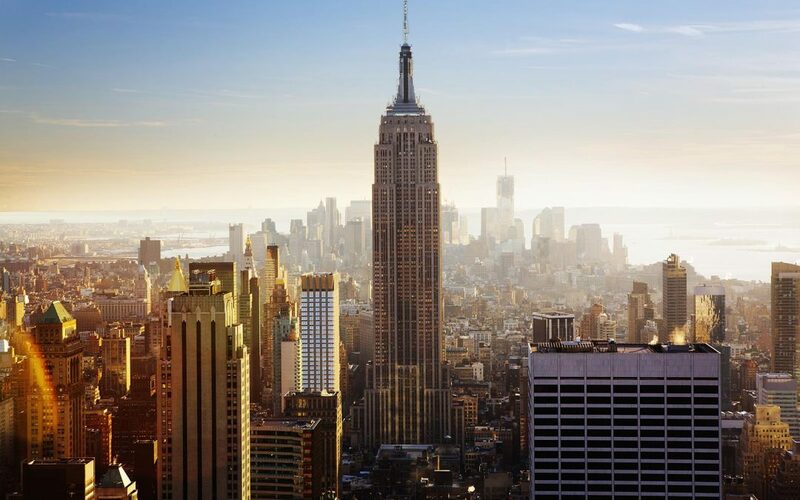 When you arrive, there are plenty of ways to get around the city. Virginia Beach offers a range of public transportation options, including the VB Wave and shuttle services. If you want to get in a quick workout as you travel from A to B, opt for bike rentals or roller blades. You can easily drive to your destination, and there are several routes that can get you to Atlantic Avenue and the oceanfront.